From Cusco, we travelled to Ollantaytambo, where we had just enough time to scramble up to the Inca ruins and see a spectacular sunset over the valley and archaeological site. The next day we started the Inca trail from the point known as Kilometre 82. We gave our 6kg of luggage to the Gap porters, and shouldered our day packs. We watched the porters' luggage get weighed - regulations have been introduced to limit the amount carried by porters to 25kg, to protect their health. Other regulations regarding pay and conditions have dramatically improved the treatment of porters on the trail. Gap seemed to act responsibly as far as we could tell. The first day is quite easy, and you see an inca site on the way. We also got a chance to try a local chicha (alcoholic drink) made from ground-up cactus and fermented for a day. We collectively decided it tasted like what drinking bin juice out of a rubbish bin would taste like. When we arrived at camp each night, the porters had run on ahead, set up our tents, set up a marquee for dinner, heated water for us to wash our faces, and were ready with a cool drink. They also all lined up and clapped when we arrived - probably with a heavy dose of irony, given what they had just achieved :) For the 15 of us we had 18 porters, 2 chefs, and 2 guides! To make up for that luxury, the toilets were uniformly terrible. My favourite was the one with a regular porcelain toilet but no seat, so you had to decide to hover or hang onto the bowl, topped off with a giant pile of used toilet paper in one corner. Day two and three were the hardest. On day two we crossed Warmiwañusca or "Dead Woman's Pass" at 4198 m, so called because the pass looks like a woman lying down in profile, with a really perky breast. It decided to piss down rain, which turned to hail at the top, and I managed to get a bad head cold overnight to make things just that little bit harder. From the pass there was a knee-jarring descent to the campsite, and another big climb the next day. Along the way we saw some more cool Inca ruins. Lunch on the third day was at a spectacular spot with views over the Urubamba valley. Em and I opted to go the long way and see one more speccy Inca ruin (Intipata), despite my cold combining with altitude sickness to make me fairly miserable. The next day we were woken at 3:40am to join the queue to get to the sun gate. This is the only time we saw all the other groups in the same place (a maximum of 500 people start the trail every day, and it is usually booked out). It was an easy and beautiful hike through the misty forest to the Sun Gate, but the pace was amazing - everyone was busting to get to Machu Picchu. When we got to the sun gate, instead of an amazing view of Machu Picchu we had a wall of cloud. So after sprinting to the gate, we all sat down and waited about an hour for the sun to rise further and burn off the cloud. To pass the time one dickhead Englishman decided to moon the crowd. The cloud eventually lifted, we got a great view and heaps of pics, before walking the last bit down to Machu Picchu. Our guide gave us a tour around the ruins, and then we wandered around on our own. One of the guys on our tour snuck off with his girlfriend and came back engaged! The trail and Machu Picchu were both amazing and made my number one experience in South America. We hit Cusco, a Peru tourist mecca, and had a free day to get our adventure on. I opted for a brand spanking new via ferrata (italian for 'iron road') in the sacred valley, not far from Ollyantaytambo, the gateway to the Inca trail. The guys who built and operate the via ferrata were really friendly. It took them 4 months to drill, bolt, and cable the route. It is only one year old. You ascend 300m via a series of ladders, including a cable traverse, all while clipped onto a steel cable with a special via ferrata safety line. The safety line is attached to the cable with two carabiners with locking mechanisms that can be operated with one hand. From the top, you take a series of massive zip lines to the bottom, the longest of which are 500m and 480m. The top speed you achieve is about 75 km/h - it could be faster if you have a strong tail wind! The gear provided by the guides was good quality, and I didn't see any loose bolts or rungs. They have plans to build a capsule hotel at the top of the cliff, so you could ascend the via ferrata, stay in a basic room at the top of the cliff for the night, see the sunrise, and take the zip line back down. Wicked! They also preparing to put up a via ferrata in the US and one in Canada. After visiting The Lodge I decided we should also take the opportunity to tick off Government House, home of the Governor-General, from the 'things to do in Canberra' list. Compared with the PM, Quentin Bryce definitely has the better job, at least in terms of appearances on Masterchef, and definitely has the better house. ER, the initials used by Queen Elizabeth, stand for Elizabeth Regina, where Regina means Queen in Latin. Dieu Et Mon Droit on the royal coat of arms means "God and my right". It is in French, which I thought was fairly strange for the English monarch, but apparently is like that because French was the language of the Royal Court after the rule of William the Conqueror. Quentin was wandering around the house talking to the great unwashed masses, which was nice. Sadly no photos allowed inside here either. The dining room (oval shaped room on the ground floor in the picture) is very impressive, and has a fantastic view out over the lake. We went and checked out The Lodge on the weekend, home of our new PM. At the time she had spent all of four days living there (she didn't move in until after the election). The house is surprisingly small and fairly unimpressive for the PM's residence. There are plenty of nicer houses around Yarralumla that are owned by people with piles of cash who aren't the Prime Minister. I can totally see why Howard opted for Kirribilli. If you're reading Jules, I suggest getting rid of those horribly ugly floral print couches, they have Janette writen all over them, and get a new BBQ, the one you have got is rusty and worse than ours. Sadly we weren't allowed to take photos inside, but here is the BBQ. 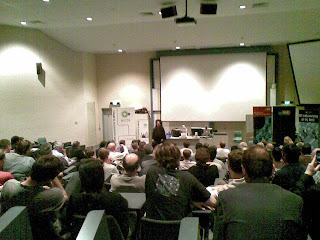 Richard Stallman didn't wield any katanas, or slay Microsoft lackeys, but he did put on a robe and halo as his alter ego Saint IGNUcius at a speech on free software for the Australian Computer Society held at ANU. Stallman spoke well, and made a good case for free software - a movement he founded in 1983 that has since been taken up all over the world. I agreed with him that society would be better off with more FOSS, particularly in schools and government. For schools I imagine parents would welcome not having to spend hundreds of dollars on Windows and MS Office for their home computers. But at the same time they may not be happy their kids haven't learned Windows and MS Office, which they are likely to need in the workforce (at least until FOSS is adopted there too). I appreciated Stallman's history lesson of how GNU and Linux fit together, but he is fighting a losing battle to get people to call it GNU/Linux, even though GNU deserves at least half, and probably more, of the credit for modern Linux distros. Similar to hacker/cracker, I think we need to let this one go. Good talk. And sorry Richard, I'm in the vi camp.